The British Racing Motors (unofficial) information centre. (try the superb town guide of Bourne by Rex Needle to find out not only all about Bourne, BRM & Raymond Mays - but also how to set out a top class web site (much better than mine !). 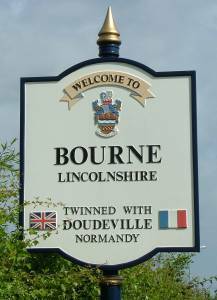 The team itself was based at Bourne, Lincolnshire. For most of its life the team was under the control of Alfred Owen of the Rubery Owen industrial empire based at Darlaston in the Black Country of England. 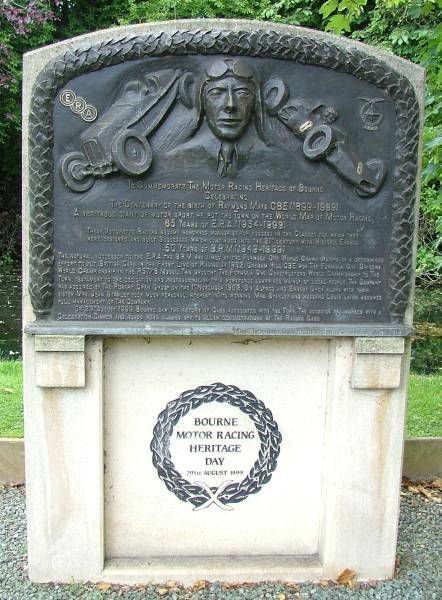 The Bourne bypass to the south and west of the town is named after it's noted motor sports hero. The exhibition, maintained on the first floor of the Heritage Centre, is a lasting tribute to and commemoration of the life and racing career of Raymond Mays and the achievements of the ERA and BRM racing cars. There is an extensive display of trophies, memorabilia and photographs, probably unique in the country, which will be of interest to all motor racing fans." Check the Bourne Civic Society website for details. 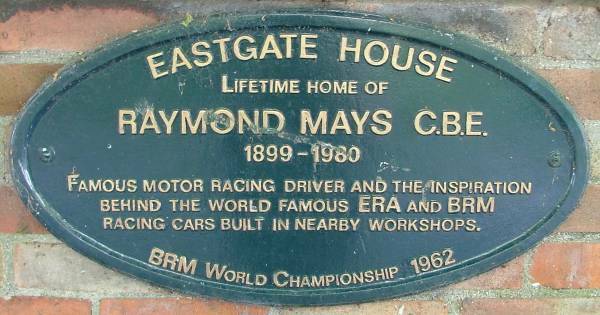 The family residence of Raymond Mays CBE (1899-1980) was an imposing Regency house in Eastgate and a plaque on the front wall reminds us that he was born here on 1st August 1899 and that this was his lifetime home. Mays established English Racing Automobiles at Bourne in workshops built on the orchard adjoining Eastgate House. The site was taken up by Raymond Mays after WWII. As a Ford dealer "Raymond Mays Converted" Fords were a feature of the business. After the death of Mays, the garage was sold and continued in private ownership up to 2005 when it closed. Outline planning permission has already been given for housing develpoment. Richardsons Auction Rooms corner of Spalding Road and Eastgate. New workshops were erected in 1960 on the site of the Bourne gas works for the BRMs to be prepared for racing. It was sold and is now an auction salesroom. The Delaine Buses site in Spalding Road. The righthand side of the compound (previously used by ERA/BRM) was added to the original Delaine site which predated the motor racing activity of the area. Graham Hill Way, an industrial estate off Cherry Holt Road, Bourne, is named in memory of BRM's World Champion. Hall & Hall and Pilbeam Racing Designs, Graham Hill Way. Originally occupied by Pilbeam Racing Designs the unit was opened in 1997 by Graham Hill's widow Bette. The unit is now used by Hall & Hall and Pilbeam have moved to a unit opposite. 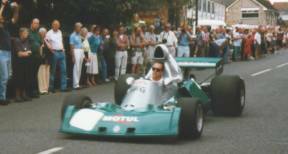 - from 2009 - "Following the success of the last three Classic Car shows in Bourne, the committee of Bourne Motor Racing Club have commenced preparations for this year's show. The event will take place on The Well Head Field in Bourne on Sunday, June 14. 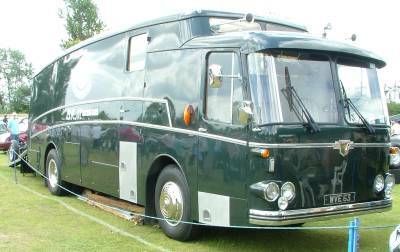 2009 A major celebration is being planned in Bourne, Lincolnshire, home of the former B.R.M. Formula One Grand Prix team, to commemorate the 50th anniversary of their inaugural world championship victory. This year also sees the 60th anniversary of B.R.M unveiling their first Grand Prix car and the 75th year of the E.R.A marque." A veritable giant of motor sport, he put the Town on the World Map of Motor Racing. were designed and built, Successes which continued into the 21st century with Historic Events. full management of The Company. Celebration Dinner and roads were closed off to allow demonstrations of The Racing Cars. This Memorial was financed with the proceeds of this Event. but also as a day where the community could come together and renew its pride in its heritage  and oh boy, did that happen! The town was packed with a crowd estimated at over 25,000, intent on enjoying an unrivalled spectacle of motor racing history and also numerous organisations and volunteers intent on making our visitors welcome." in August 1999 were generously provided by David Smith. The team, for most of it's life, was under the control of Alfred Owen of the Rubery Owen industrial empire based at Darlaston in the Black Country of England. The town is no longer part of the ancient county of Staffordshire, being part of the County of West Midlands (created in 1974). 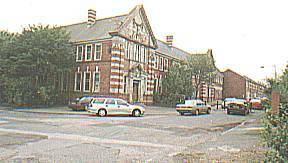 26 June 2003 - corner of Booth St. & Queen St. Booth Street - the site of the former Rubery Owen factory. In 1884 the J.T. and T.W. Rubery of Darlaston established a small light metal work factory. Alfred Ernest Owen, from Wrexham, joined the company in 1893 and in 1905 the firm became Rubery Owen & Co. Owen became sole owner in 1910 and the business grew to become the largest privately owned manufacturer in the country. In October 2004 this building was sold for £1 to Walsall Housing Regeneration Agency for use as the Rubery Owen Enterprise Centre. 26 June 2003 The main Booth Street factory closed in 1980 and most of the site was replaced by the "Victoria Mews" housing development. The centre piece of the estate is a large machine press from the factory - a reminder of when the area lived by "metal bashing". At the junction of Princess Way, Empress Way, Memory Lane and Windsor Walk. 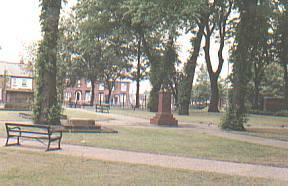 July 2004 - between New St. & ASDA supermarket Owen Memorial Garden - As well as major employers, the Owen family were great local benifactors.The memorial reads - This garden was laid out and given to the people of Darlaston in memory of A.E. Owen by his wife and family in the year 1932.Originally opened on 17th May 1932 the garden was re-dedicated on 12th June 2003 by grandson (and Rubery Owen Holdings Ltd. Chairman) David Owen. 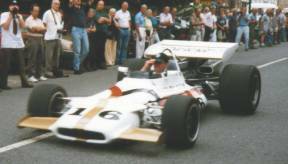 The OWEN MOTORING CLUB website - Owen Motoring Club - is keeping the name of BRM alive. Owen Motoring Club was formed in December 1959 by a group of motoring enthusiasts from the Rubery Owen Engineering Company and keeps the link as Sir Alfred's son, David Owen OBE, is the club's President. Folkingham Airfield a little way from the village of Folkingham (near Bourne) was used as a testing track from the BRM's official launch on 15th December 1949. The site was also used for early workshops. Engine testing continued on at the site. Later a further dyno testing house was added and was used for commercial projects and the CanAm Chevrolet engines  this is still in use by Hall & Hall for engine work. Hall & Hall (Rick and son Rob) currently have their restoration centre there in place of the earlier Hall & Fowler concern. Former BRM workers Rick Hall and Rob Fowler set up on their own after the 1977 season. In 1981, when BRM finally closed, the pair took over the engine test house on the airfield which now forms part of their more modern workshops. 1940 Situated a few miles North of Bourne, Lincolnshire near the village of Folkingham, the site was opened as a decoy airfield which was set up to divert enemy aircraft away from nearby operational airfields. 1941 The dummy airfield was abandoned in 1941 when daylight air raids had almost ceased. 1943 The same site was probably developed as a standard pattern bomber station for No 5 Group, Bomber Command. Two subsidiary runways 1,400 yds. 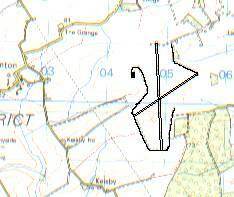 1944 when Folkingham was ready for use it was handed to the US IXth Air Force, opening on 5th February. The unit supported four squadrons with a total of 70 C-47 Dakotas transport aircraft. 1944 The unit took part in the D-Day landings delivering 1,181 paratroopers of the 508th Parachute Infantry and the 82nd US Airborne unit to Normandy. 1944 90 transport aircraft delivered paratroopers of the British 1st Parachute Brigade to Arnhem. 1945 Folkingham closed to flying on March 20 1945 and was finally handed over by the USAAF on 15th. April 1945 to RAF Maintenance Command. 1945 Technical Training Command took over until1946. 1947 Folkingham closed down (again!) on June 27. 1959 From late 1959 three Thor ICBM missiles were operational at Folkingham. 1963 This unit disbanded in August 1963 and the airfield was closed (for the final time!). 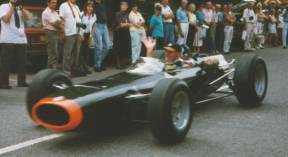 "For those motor sport enthusiasts old enough to remember, the market town of Bourne will always be linked with the BRM grand prix team of the early sixties. It is no surprise therefore that engineering firms and garages such as Hall's Garage became involved with the Formula One company and in Graham Hill's championship winning year, Hall's Garage actually worked on the cylinder heads and light machine work for BRM. They would cross-etch hone the cylinder block for BRM right up to their demise in the early seventies. 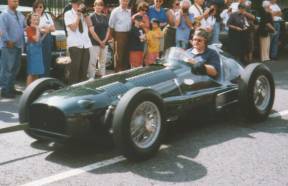 Indeed such was the family firm's depth of knowledge of the cars that Steve's brother Rick formed Hall and Fowler to restore BRM's - a link which has remained with the company to today." New Hall, Sutton Coldfield, Warwickshire. New Hall, Walmley Road, Sutton Coldfield, Birmingham. Alfred Ernest Owen (1869-1929) had his Rubery Owen Company based at Darlaston where he was a major manufacturer of automotive and aerospace components. Like many successful Victorian industrialists, Ernest (as he was known) invested some of his wealth in a property to match his standing. 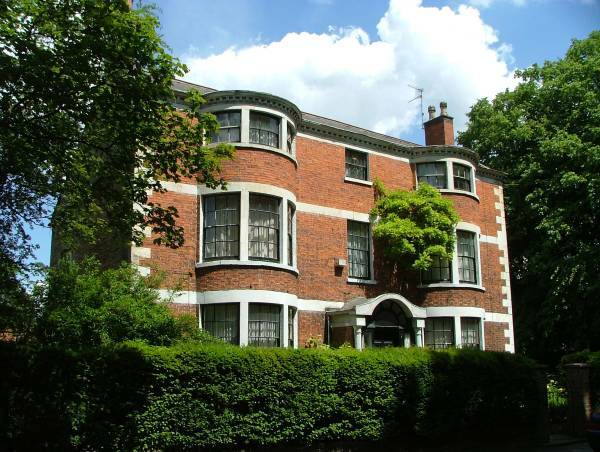 "Ernest Owen lived in an ancient moated mansion known as New Hall, although it was originally built about the year 1200 in the manor of Sutton Coldfield. It was extensively rebuilt in the sixteenth century and both the great hall and the banqueting hall have their walls lined with beautifully carved-oak paneling of the period and ceilings of moulded plasterwork, elaborately ornamented and painted. Surrounded by a deep clear moat, spanned by two stone bridges, New Hall is set in beautiful gardens and extensive wooded grounds which contain an ancient water mill and old fish ponds. Ernest Owen acquired the property early this century for his family home and it provided the room to display his collections of furniture, paintings and object d'art. The dry dark vault, affectionately known as "the dungeons", provided the ideal storage condition for his large print collection, hence the brilliant clean state in which they were rediscovered after 60 years, on the eventual disposal of the property." The previous information was found in the old site detailing Ernest Owen's important collection of early Victorian colour prints by J.M. Kronheim & Co. of London to the Baxter patent oil colour printing processes - "http://www.acid.co.uk/acid/hp.htm". "Despite its name, Sutton Coldfield's New Hall is reputed to be the oldest listed inhabited moated house in England. Seven miles from Birmingham, it is set back from the roadside, surrounded by 26 acres of gardens and boasts an eventful history. William The Conqueror executed its first owner, and subsequent residents included several Earls Of Warwick. After his father, Ernest, Sir Alfred Owen, as chairman of Rubery Owen and Company Limited took over the property. Industrialist Michael Blakemore was the last person to live at New Hall as a private residence before Thistle Hotels bought it in 1985. Now a luxury country house hotel run by Ian and Caroline Parkes, its proximity to the NEC (National Exhibition Centre) has meant visits from stars such as Robbie Williams and Cliff Richard. And if the lounge, with its views of manicured lawns and topiary, evokes the sort of showbiz grandeur demanded by Pavarotti (whose picture hangs above the reception desk), then the restaurant recalls the lives of the English nobility. The dining room dates back to Anglo Saxon times and still contains the original 17th century fireplace, along with windowpanes made of 16th century Flemish glass. The restaurant has an impressive pedigree, having held the highest RAC award, the Blue Ribbon, for the last six years. It is also listed by this year's Harden's guide to top restaurants in the UK. With the ever-watchful Caroline Parkes making sure the restaurant runs smoothly and the guests are pampered, it is difficult to find anything sub-standard about our visit. Our bill, which included pre-dinner drinks from the bar, came to £106 for two. This seemed on the expensive side but, given the superb food and location, New Hall is nothing less than a total gem." Sir Alfred's Way, off Walmley Road, Sutton Coldfield, Birmingham. A street a little to the north of the New Hall Hotel is a reminder of the Owen family connection. 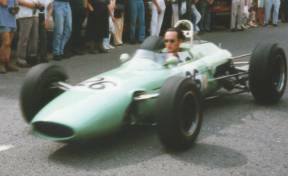 1959 / 1970 in the Owen Racing Organisation colours. 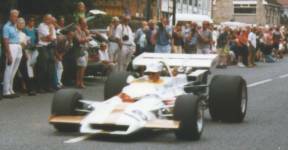 1970 / 1971 in the colours of Yardley-BRM . 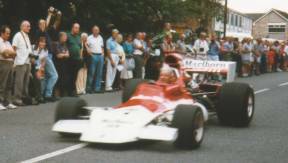 1972 / 1973 in the colours of Marlboro-BRM. © David Hodgkinson 2001-2015. All rights reserved.